Lyn Middleton Senior nurse, Revalidation Team, Aneurin Bevan University Health Board, Royal Gwent Hospital, Newport, South East Wales. Denise Llewellyn Executive director of nursing, Aneurin Bevan University Health Board, Headquarters, St Cadoc's Hospital, Caerleon, South East Wales. This is the second in a series of eight articles providing information about the Nursing and Midwifery Council’s (NMC) revalidation process. 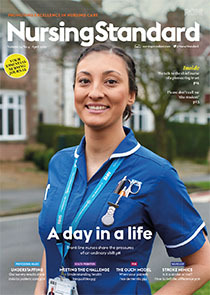 This article focuses on recording and providing evidence that you have practised for a minimum of 450 hours, or 900 hours if revalidating as both a nurse and midwife. Some of the direct, indirect and non-clinical practice activities you have undertaken over the past 3 years. How you could provide evidence to support your practice hours.